Guests of our newly renovated Golden Valley, Minnesota hotel love our location only 5 minutes from downtown Minneapolis without the hassle and expense of a downtown hotel. 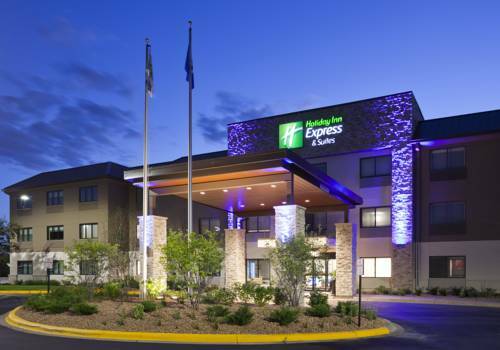 Our hotel guests enjoy easy access to Interstate 394 and Highway 100 which connects us to the nearby cities of St. Louis Park, Minnetonka, Plymouth, Hopkins, Brooklyn Park, and Edina. Offering amenities such as free parking, complimentary breakfast, and free wireless high-speed Internet, our Minneapolis/Golden Valley hotel has a perfect Twin Cities location for going to a Minnesota Twins game at Target Field or a concert at Target Center. Hotel guests say our free shuttle to The Shops at West End is perfect for heading to dinner and love that we are just a few minutes from a drugstore, gas station, and grocery store. Families use our Golden Valley hotel as home base when traveling as our indoor pool has enough room for cannonballs and a whirlpool to relax. Our free daily breakfast features hearty and healthy options of an egg and meat entr e, frosted cinnamon rolls, yogurt, hot & cold cereal, fruit, milk, and a variety of juices. Guests also like the convenience of a microwave and refrigerator, standard in each guest room.Corporate Business Hotel Guests can take our complimentary shuttle to nearby businesses such as General Mills, Park Place East & West Business Complexes, Cargill, Park Nicollet, North Memorial Hospital, and Honeywell. Meeting room accommodates up to 50 people. Room rental includes complimentary use of internet, LCD projector and screen. Food and Beverage Service may be provided by the hotel. Great for Private meetings, gift openings, social gatherings and training. Brookview Golf Course offers an 18-Hole Regulation Course and a 9-Hole Par 3, a driving range and teaching area, and a golf shop and grill. Brookview's Regulation Course is a challenging, mature course with some tree-lined fairways. Golden Valley Golf and Country Club is committed to providing its members, families, and guests a congenial and relaxed experience highlighted by our golf course and complemented by excellent dining, tennis, swimming and social activities. Valleyfair is a 90 acre amusement park with over 75 rides and attraction, plus several great food venues and activities for all ages. Go and see a film at the IMAX theatre, cool off at the waterpark or race at the speedway. The Mall of America in Minnesota has more than 500 specialty stores, 50 restaurants, 7 nightclubs and 14 movie theaters. It's fun for skateboarders of all expertise levels! The Walker Art Center is a catalyst for the creative expression of artists and the active engagement of audiences. Focusing on the visual, performing, and media arts of our time, the Walker takes a global, multidisciplinary, and diverse approach. The Minnesota Zoo is a zoo for all seasons! Even when the weather is cold and nasty, the Tropics Trail and Discovery Bay are warm featuring animals from the Caribbean, South Pacific, and tropical rain forests. Dont forget your camera! Canterbury Park is home to Live Racing, Simulcast Racing and a 24/7 Card Club featuring Texas Holdem, Blackjack and more. Along with special events like the Midwests largest Craft Show and thrilling snowmobile racing. At Minnesota Children's Museum, kids will have a blast discovering an exciting, immersive world that arouses their curiosity, increases their understanding, and ignites an appreciation for learning for children six months to 10 years old. Welcome to Orchestra Hall, home of the internationally-acclaimed Minnesota Orchestra and outstanding classical music performances since 1974.